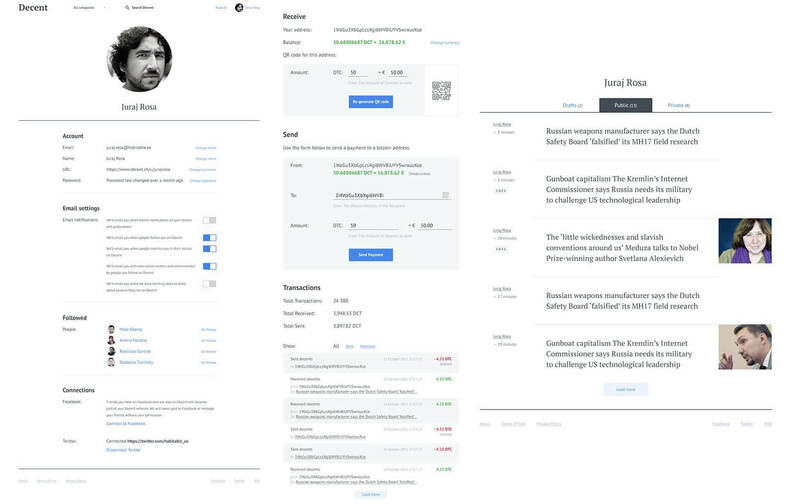 What does blogging through a decentralized network look like? Publishing through a decentralized content distribution platform may sound too complicated for everyday usage. 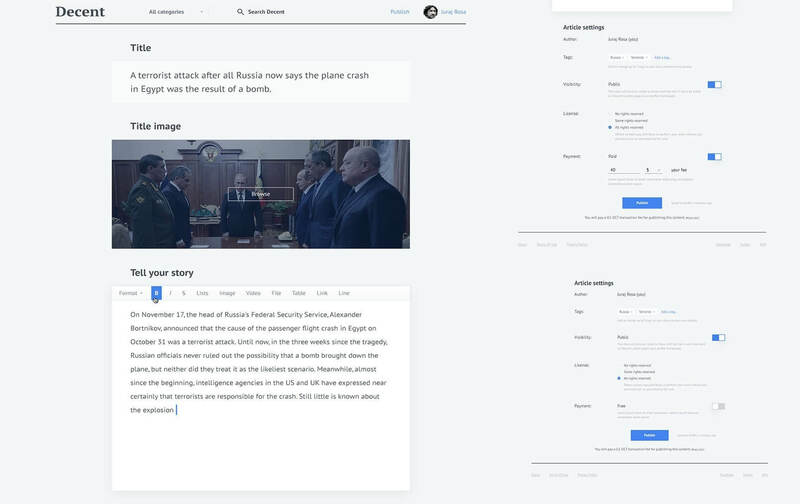 Let me introduce you to the very first application, Medium-like blogging platform, that will be build on top of DECENT protocol to explain what the process really looks like. In order to prove that Blockchain based applications can become a basic component of modern society we would like to show you all the elementary functionalities of DECENT Network. Features such as content publishing & buying, author/content rating, account creation, article search engine etc. are all wrapped up into a nice and user friendly design to overcome all the hesitation and doubts and provide an intuitive experience for everyone. To gain access to DECENT Network, firstly you need to sign in and create an account. Afterwards you will have your own profile within the network where you can edit your settings such as username, registered email address, password, email notification preferences. You can as well manage people who you follow and possibly connect your account with your public profile on Facebook and Twitter. As a content creator you can also access your work through your profile. All the published articles, drafts and even the articles you have decided to keep private for now are available for you at one place. There is also a wallet section in your profile that displays your address, the amount of DCT you have and keeps records of your transactions. You can check the number of transaction that you have made on DECENT Network, the overall amount of received and sent DCT. Moreover it also shows details of every transaction This is a place from where you can make transactions by simply specifying the amount you want to send and inserting the destination address where are the funds supposed to go. 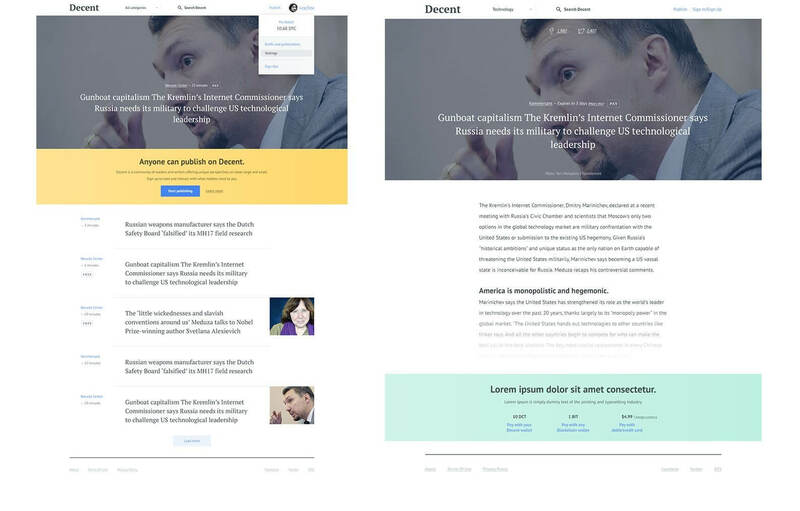 DECENT blogging platform homepage consists of suggested articles, trending topics and search bars where you can either specify a particular key words you are searching for or browse the categories from the drop down menu. When logged in, you will be able to display your DCT balance or open your settings by clicking on your name and profile picture in the top right corner of the page. The actual content buying is an easy process consisting of a few clicks. After selecting an article, you will be able to read a certain part of it. If you consider the article to be relevant and interesting and you would like to continue reading you will need to choose one of the payment options displayed below. When the payment is all done, you will gain access to the rest of the article. Later on you can also rate the author or the article itself and thus help it to become visible for more users. DECENT Network is based on a decentralized trust. Therefore the reputation layer is what makes valuable content to appear longer and irrelevant content to disappear. Are you wondering how to get DCT which is a software tool that makes DECENT work? Remember you still have a one-time opportunity to become part of DECENT right now by joining our ICO! Publishing process on DECENT Network consists of text composing and formatting and setting the conditions under which people can download the particular content. As an author on DECENT you keep the power over your work in your hands all the time. You can decide to publish your article for free or put a price tag on it. Thanks to no hidden fees involved in the process 100% of the amount readers pay go directly your account. DECENT is great place to build your audience, earn credibility and become a well-known author over the time. As DECENT aims to become a worldwide network of content distribution, we are determined to provide the best possible service that will benefit every user. Our goal is to create a fully functional easy-to-use publishing platform with the highest level of Trust and Security that will connect authors directly to their readers and eliminate the unnecessary middlemen. Stay tuned to our news and latest updates by subscribing to our newsletter. More exciting news coming soon!